Jefferson Davis Park Rally June 2015! 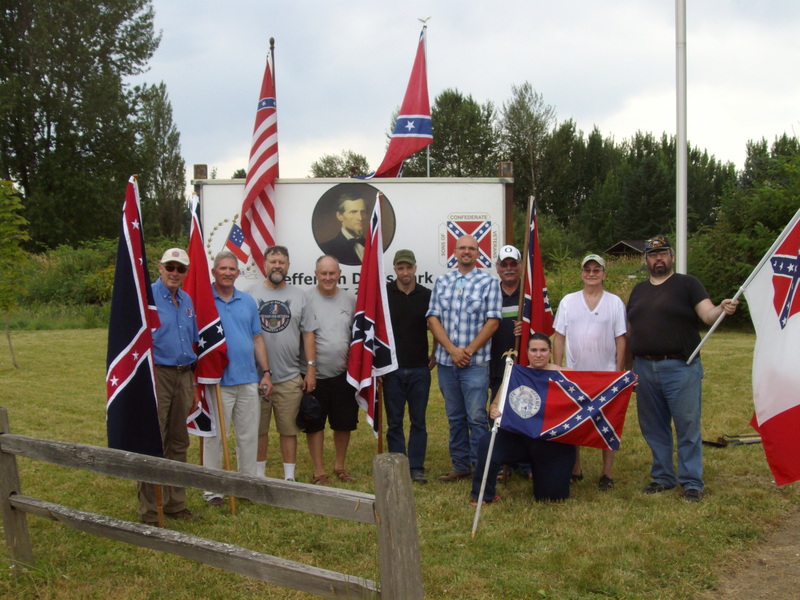 On Saturday, June 27th, members from the Pacific NW Division of the Sons of Confederate Veterans Rallied to protect Jefferson Davis Park in Ridgefield Washington. 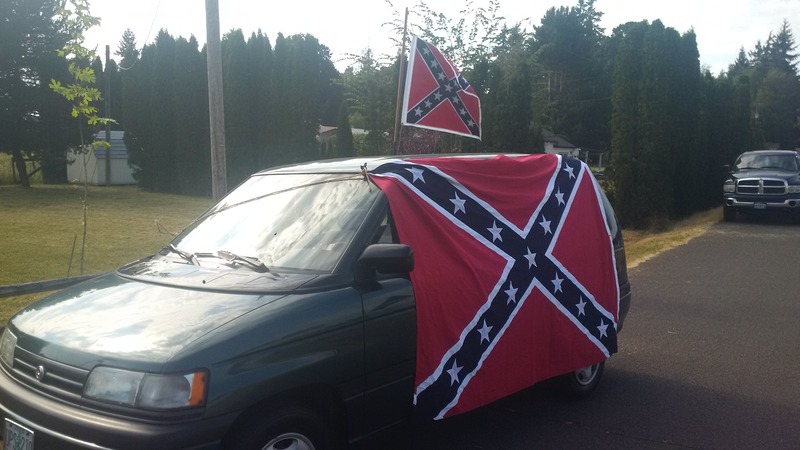 Earlier that week there were threats to burn our Flags from multiple sources, including Willamette Week. So to ensure that the park did not fall victim to senseless vandals, we held an all day rally. 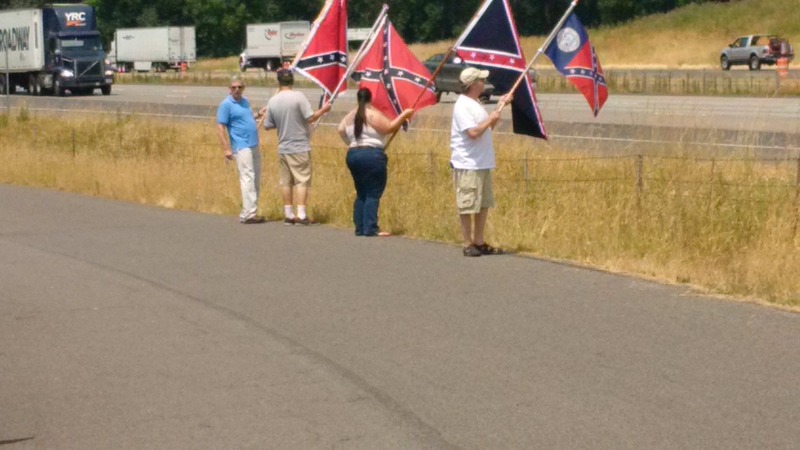 The quickly assembled Rally was a great success, with over 20 of our members and friends of SCV showing up, plus dozens of motorists stopping by to show their support for the cause. People stopped by to buy flags, enjoy a burger and hotdog and play games under our portable awning. Commander Ernst showed guests the park and shared the history of how the park and makers came to be. 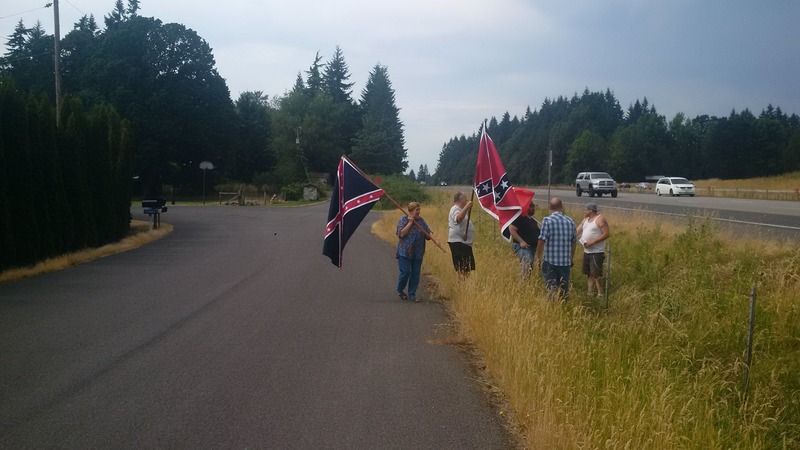 Several of our members were lined up next to Interstate 5 waiving different types of Confederate Flags. 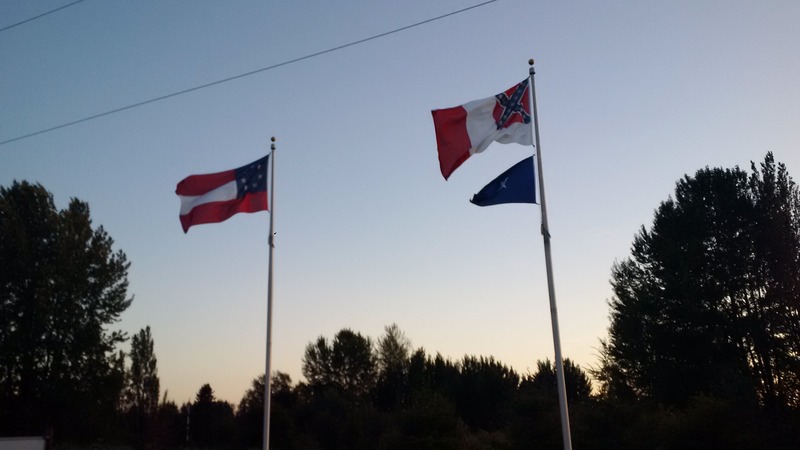 They are now known at the Pacific NW Division Flaggers. 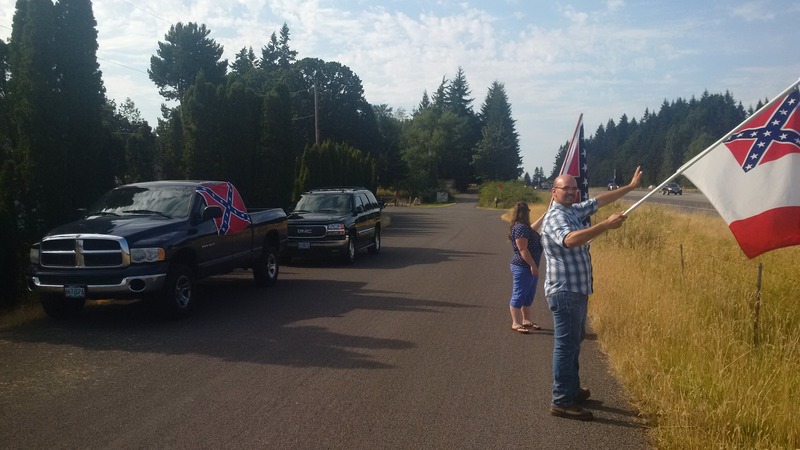 Our Flaggers were greeted by thousands of people honking and waiving in support of us. Of course, there were those who chose to flip us off, but it didn’t faze us, we just smiled and waved right back. For every 10 people who honked at us, 9 would wave and one would disrespect us. Needless to say, there are an enormous amount of people who are on our side. We had one of our members and a soon to be member bring lawn mowers, so we were able to get the grass looking good again. Plus, we weeded the walkway and cleaned the markers. 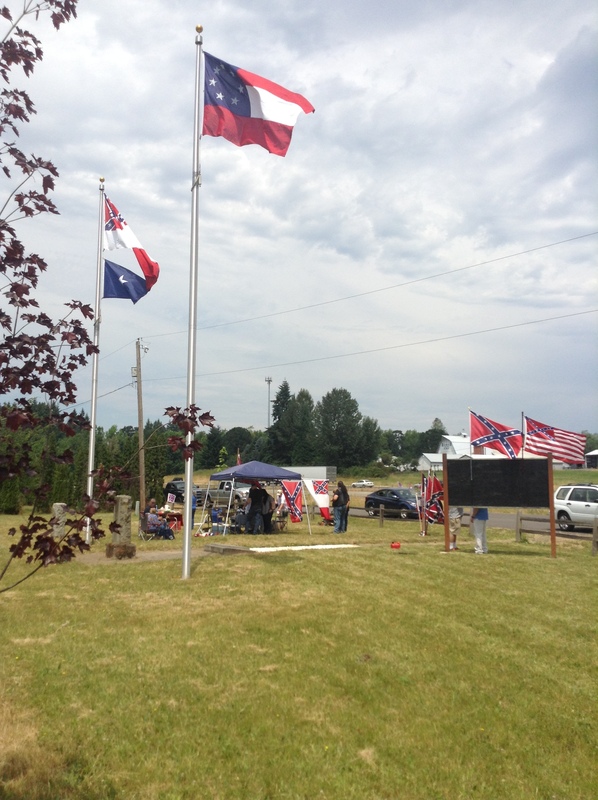 It was well over 90 degrees out, but that didn’t stop our dedicated Confederates. Thank you to all who came to the Rally! This entry was posted in Uncategorized on July 7, 2015 by scvpacnw.